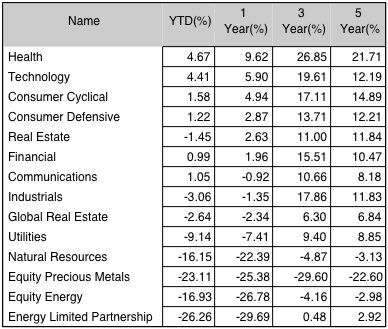 One of the primary screens for making investments involves the selection of the most profitable sectors, as seen from a one year, but also 3- and 5-year point of view. Health Care ranks first on one year, three year and five year basis. Technology and Consumer Cyclical rank next.